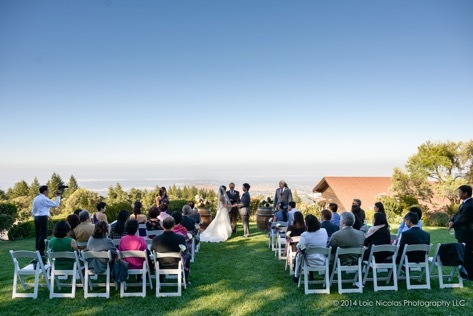 The experienced and attentive Event Coordinators at Thomas Fogarty invite you to view the facility and see why so many couples have chosen it as the ultimate, romantic place to begin the rest of their lives together. The rental fee for a small wedding is $5,000. The renter will have use of the Redwood Room & Lawn Area for eight consecutive hours. The event must conclude no later than 10:00 p.m. and the caterers must be off the premises by 11:00 p.m. These 8 hours includes two hours for the caterer to set-up and one hour for the caterer to clean up. We hold one wedding a day with your choice of a time frame between the hours of 9:00 AM & 11:00 PM. Latest rental time is 3:00 PM to 11:00 PM (party ends by 10:00PM). We have a preferred list of wonderful, local caterers to ease your search. We have a list of music production companies which must be selected through our preferred sources. Award winning Thomas Fogarty Wine & Sparkling Wine and Gordon Biersch Brewing Company beer only. We do not allow hard alcohol. You have the choice of serving wine only or beer and wine. We allow up to four musical instruments on the lawn. No Amplification or microphone use is allowed on the lawn area.